At the dawn of the 17th-century, when Queen Elizabeth had grown old, the eyes of England turned to Mary, Queen of Scots’ son, James, as the rising sun in the Tudor kingdom. ‘After Elizabeth’ focuses on the intense period of raised hopes and dashed expectations between Christmas 1602 and Christmas 1603, the close of the Tudor period, and the opening of the Stuart era, when England and Scotland became united under one monarch for the first time. It is a story in which fortunes were to be made and lives lost as courtiers vied for power. 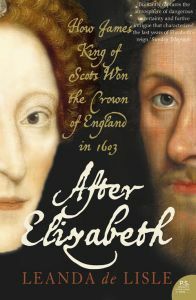 As well as describing Elizabethan court life, ‘After Elizabeth’ explores the corruption and persecutions which set the stage for King James’s accession to the throne of England, and the forces that shaped him: his separation from his mother, the violence of his Scottish kingdom, and his marriage to his queen, Anna. Drawing extensively from Tudor and Stuart accounts, After Elizabeth paints a detailed picture of the cusp of the two eras, bringing to life a period of glamour and intrigue, that marked the beginning of a new age.